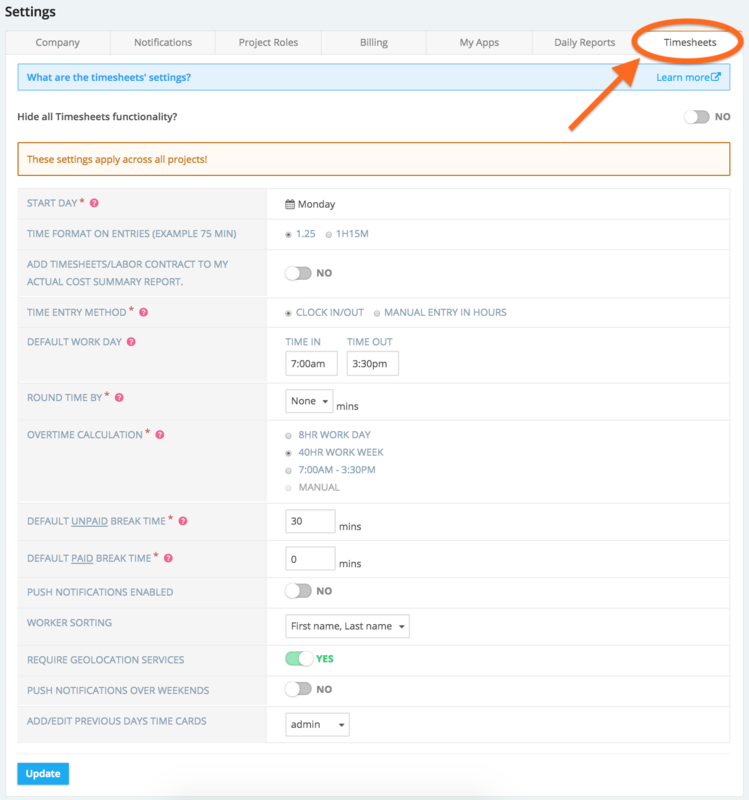 Understand which settings are best for your company's timesheets' configuration. To get to the Timesheets Settings you'll need to go to Settings on the Buildingblok main page after logging in. 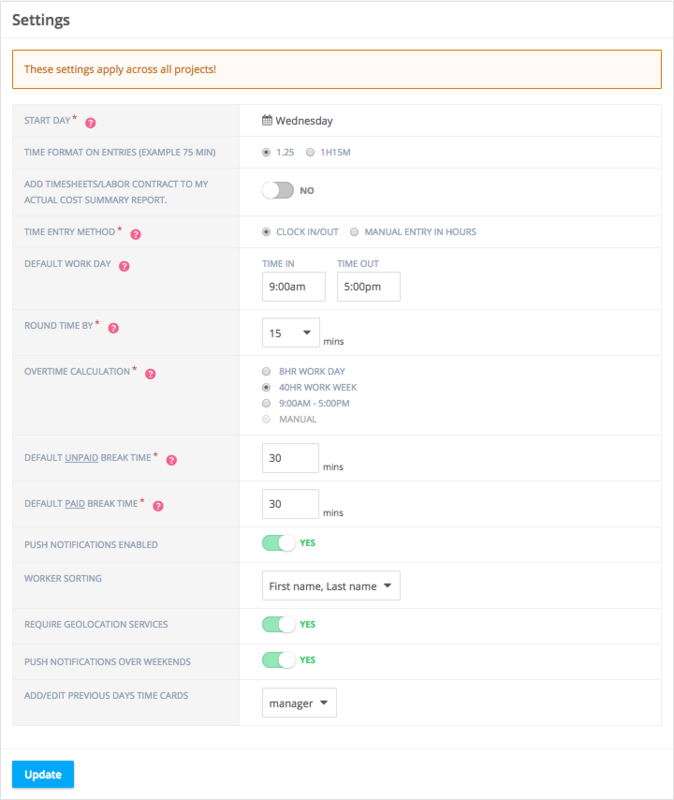 *Please note: you'll also see the Timesheets Settings on your first log-in to set that up. Once there, you'll need to head to the Timesheets Settings tab. Set the first day of your work week. Timesheets and reports will begin on the selected day. *Start Day cannot be changed after the first Timesheet entry. Clock In/Out: Requires workers to Clock In/Out from the Web and Mobile. Manual Entry in Hours: Requires workers to manually add their hours (ex. 8Hrs instead of 9:00am - 5:00pm). *No Clock In/Out functionality. Set the default Start and End times for when manually adding/editing a time entry. Automatically round time by either 15min, 30min or 60min increments. Ex. If 15 minutes is selected, 9:07am rounds to 9:00am and 9:08am rounds to 9:15am. Only applies to Clock In and Out time entry method. 8Hr Work Day: Overtime is the amount of time that exceeds 8Hrs in a day. 40Hr Work Week: Overtime is the amount of time that exceeds 40Hrs in a work week. In/Out: Set a Start and End time for a shift. Overtime is the amount of time that exceeds the End Time. Manual: Allows you to manually input Overtime Hrs. When a user adds an Unpaid Break, this is the default number shown. When a user adds a Paid Break, this is the default number shown.Ex. 8Hrs + 30mins paid break = 8.5Hrs"
Push Notifications send alerts to users who have installed the Timesheets mobile app. This occurs approximately 10 minutes before the Default Work Day's Time in, and then once again on the actual time if the worker hasn't clocked in by then. Worker sorting allows you to choose how your worker appear in the Timesheets entry table; either First name, Last name or Last name, First name. You can change this at any time. This forces all mobile app users to have GPS as well as location services enabled for the Timesheets app. Once it's on, all mobile users must have both activated in order to perform any action through their phone. This will give the ability to change the past time entries. If workers are selected, then they will be able to go back and edit time entries as they please. It's the same when set to manager. By default, it's set to admin. This means that only administrators would be able to edit timecards from the past.